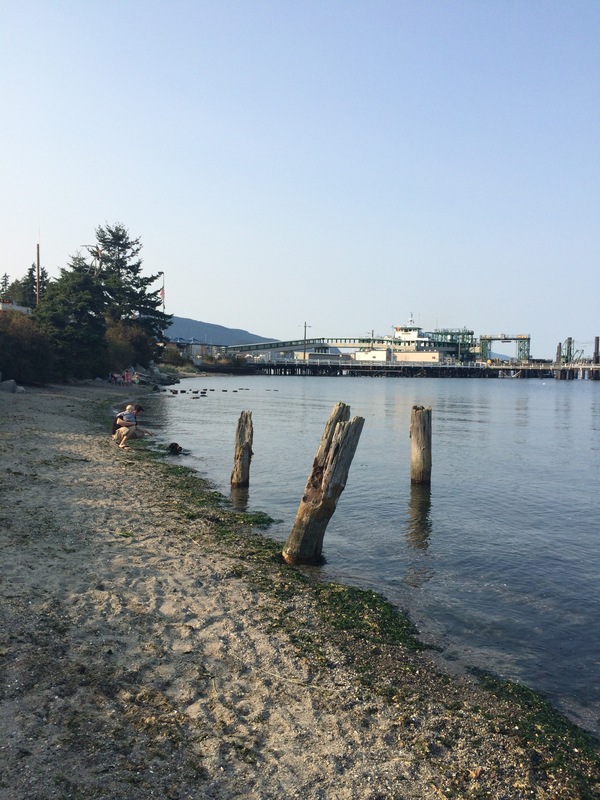 Recently Mumbles and I took a long weekend getaway to Orcas Island – it’s one of the San Juan Islands off the coast of Washington, north of Seattle. This was our third time visiting and our first time with Declan. It was also our first time flying with baby and though just a short flight and quite uneventful, I did manage to knock some guy in the head with my diaper bag and Declan yanked a nice lady’s hair (really hard) as we were walking slowly down the center aisle to get to our seats. Luckily, most everyone was really gracious and couldn’t help but excuse our little guy with his charming smile and baby blues. Orcas Island is a special place for us – we have a fondness for the water and it’s an extraordinary location where mountains meet ocean, you can hike in the forest, walk to waterfalls, kayak in the ocean, swim in a lake, dine on fresh seafood, breathe crisp fresh air, marvel at the beauty of nature, and disconnect from busy city/work life. And lucky for us, we have family that live there giving us good reason to visit! The thing about traveling to a place like this is that even the transportation forces you to get out of your hurried mindset and slow to a more gentle, easy pace. It takes some planning and forethought to make sure you arrive on time to catch the ferry, but it always involves a lot of sitting and waiting once you’re there. And if you happen to miss the ferry or it’s full, you simply must wait for the next one. That’s just the way it is. “Island time” isn’t just for the tropical islands, I guess. We grabbed some takeout food in town and laid it all out in the trunk of the SUV when we got in the ferry line like a classy chinese food tailgate. We had hours to kill before the next ferry so we spent some time down by the water to explore the beach with Declan. 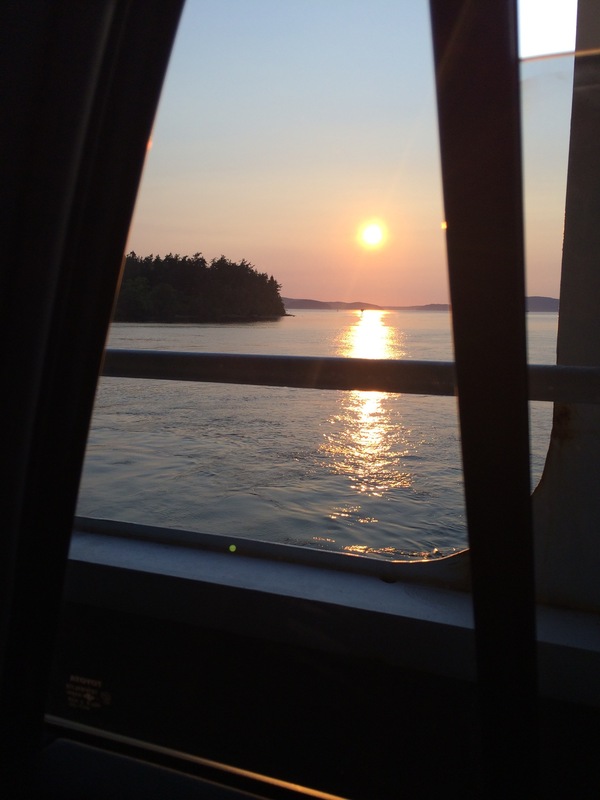 The timing of our ferry ride was perfect for a spectacular sunset on the Sound. In the mornings we’d wake up and make coffee and enjoy the eerie fog that would completely cover the ocean water. By mid-morning it was back to being vividly clear. It’s so magical and I think that even if I lived there, it wouldn’t lose its wonder. 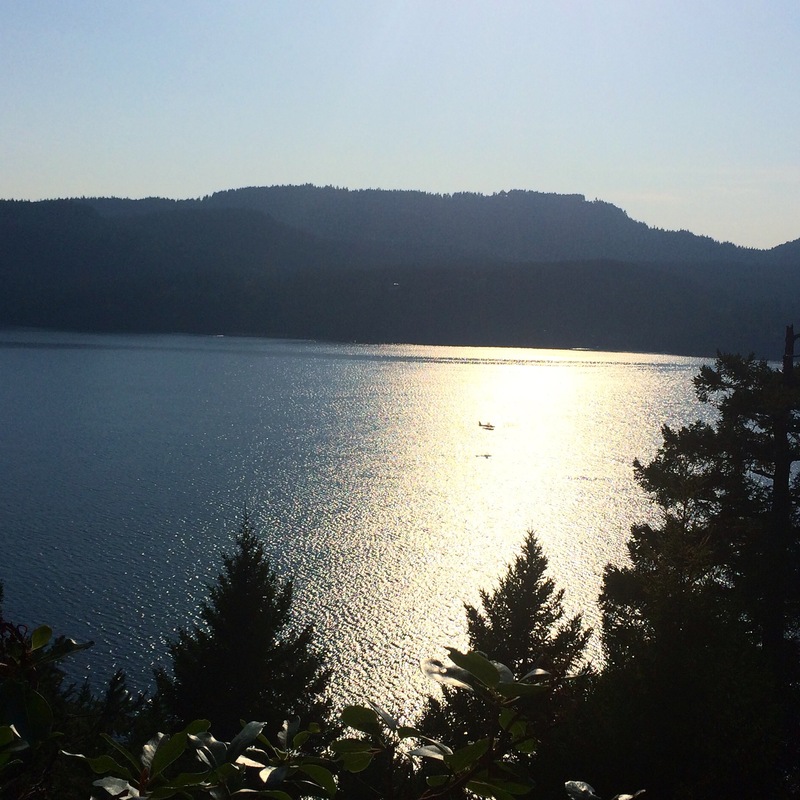 Isn’t the view from Mumbles’s aunt’s deck overlooking East Sound breathtaking? 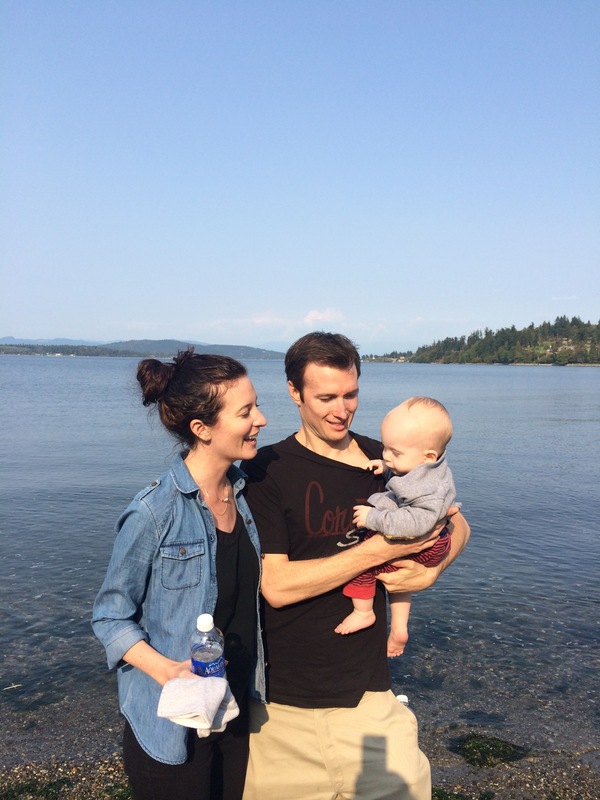 In the afternoons we’d take a hike to the waterfalls, walk around the lake, have lunch in Eastsound watching the boats come in and sea planes land on the water, play with Declan in their living room, or relax on the patio with a nice bottle of wine. Mumbles’s aunt thought of really lovely touches to make our stay carefree and enjoyable from start to finish. The adorable guest cottage has a super plush queen bed with these jersey knit sheets. I’d like to splurge on a set for our bed at home – they were so cozy to curl up in at night, soft like flannel but not hot, just really comfortable like your favorite worn-in t-shirt. Doesn’t that sound amazing? They are. This past summer, Mumbles’s aunt and uncle completed a transformation of their outdoor barbecue space into a “Tea House” for guests – it’s a small enclosed building with a table for two, a full sink, keurig, mini fridge and freezer, and microwave oven – “perfect for early morning coffee and midnight cookies and ice cream!” according to his aunt. They really have thought of everything to make their guests feel welcome. 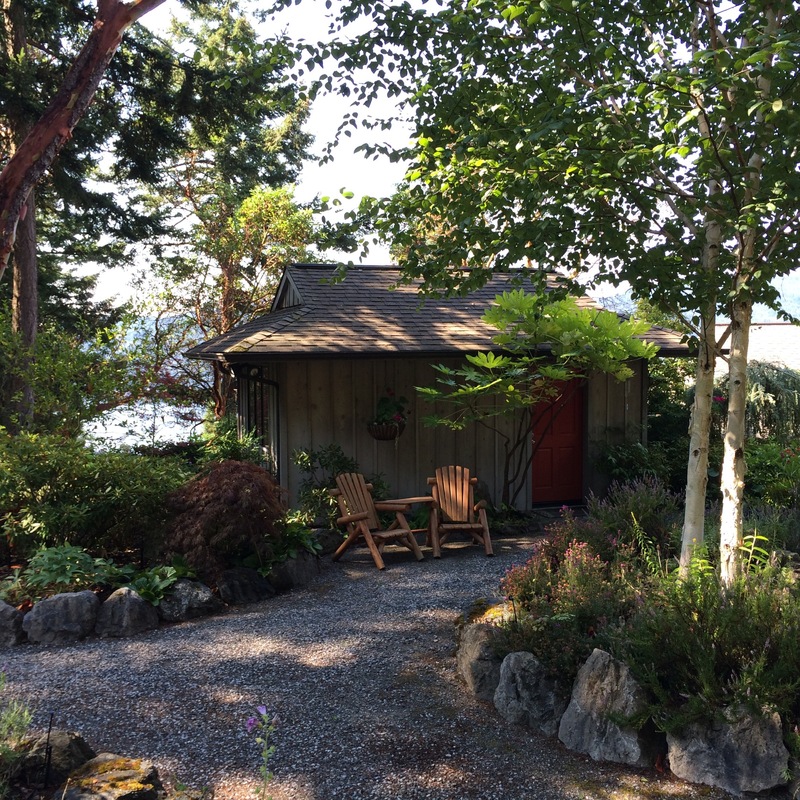 The tea house was born out of need for a non-intrusive space for their guests visiting from the East Coast who would wake up around 3 a.m. (6 a.m. East Coast time) needing coffee but not wanting to disturb them in the main house that early. She joked that she’d like to have future guests fill out a questionnaire of their favorite snacks and drinks so she can stock the fridge before they arrive – isn’t that such a clever idea for hosting? 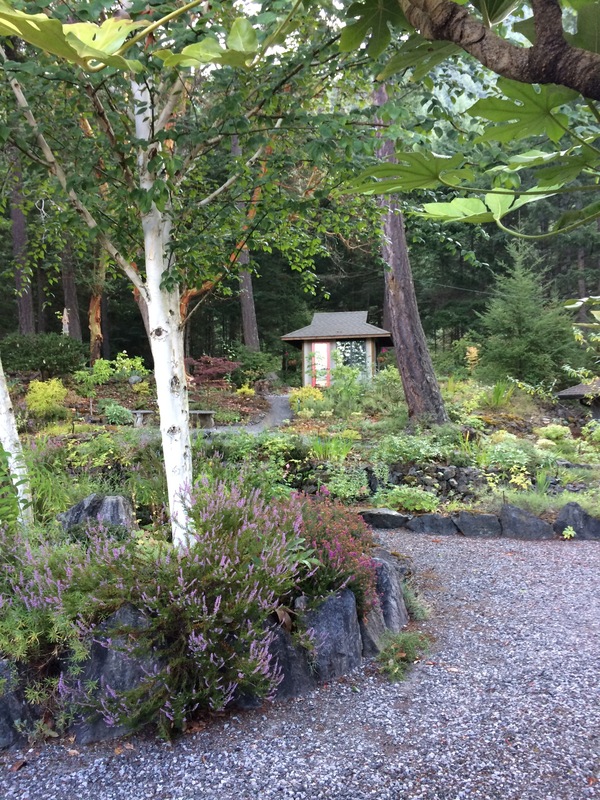 Here’s the winding walkways leading up to the Tea House from the Guest Cottage. 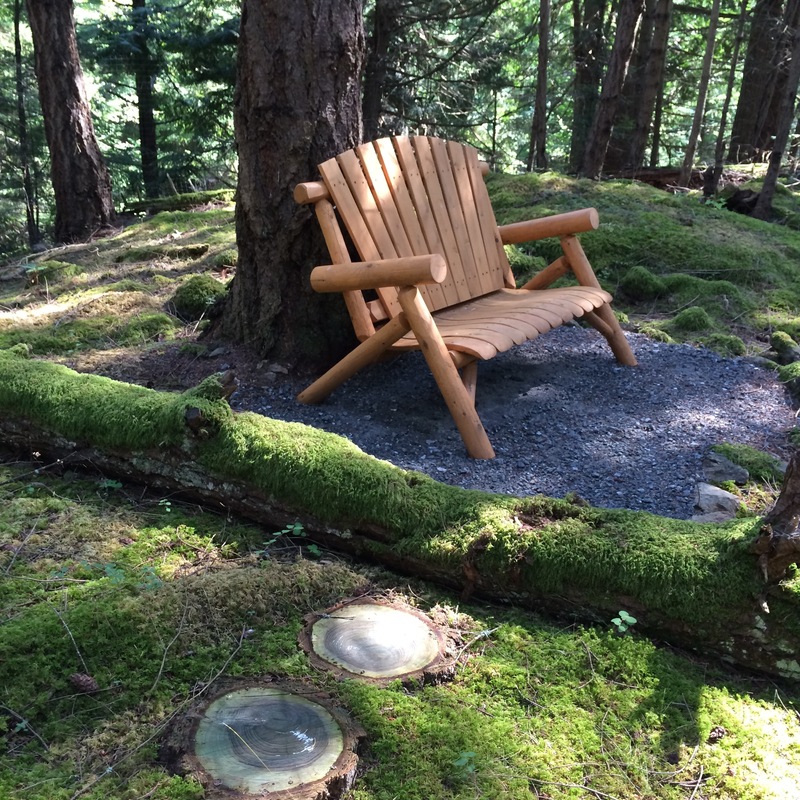 They’ve spent years creating an impressive garden over two acres of their property with meandering gravel paths and rocking chairs and gliders along the way in different spots to sit and take in the view, read a book, or rock your baby to sleep, as it may be. 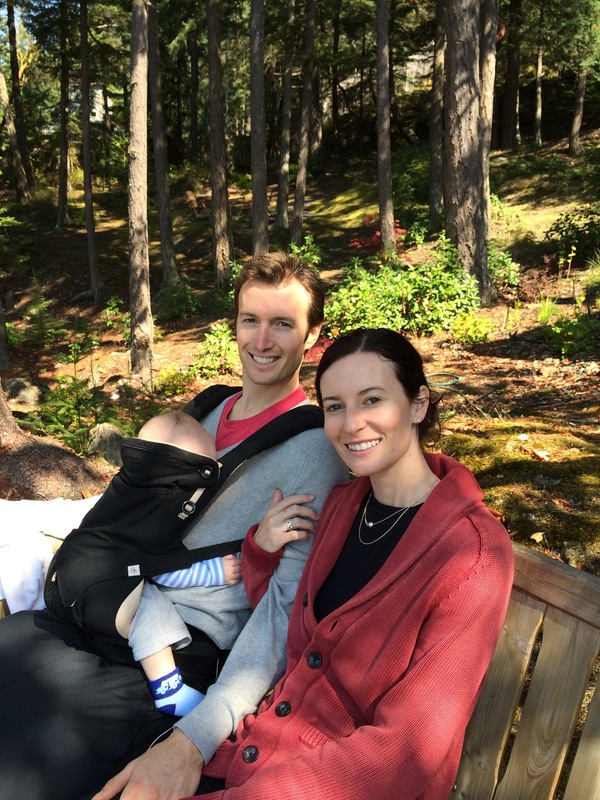 We took a few leisurely strolls with Declan in the Ergobaby 360 carrier – facing in when he was tired and we knew he’d take a snooze (there’s something about really fresh air that is both invigorating and at the same time makes you want to take a nap!) and facing out when he was awake so he could see all the lush plants, touch leaves and tree bark, and smell the flowers and pine. Orcas Island is truly an incredible place. Like most hidden gems, it’s quite a trek to get there. If you don’t have family or friends waiting to pick you up at the Seattle airport, I’d rent a car (which is what Mumbles and I did for our first visit) and spend a day or two exploring Seattle before driving up to Anacortes to catch the ferry to the islands. Next time, though, Mumbles and I agree that we’d like to take a sea plane from Seattle and fly straight into Eastsound, which is quite common and looks just as cool as those helicopter rides on The Bachelor. 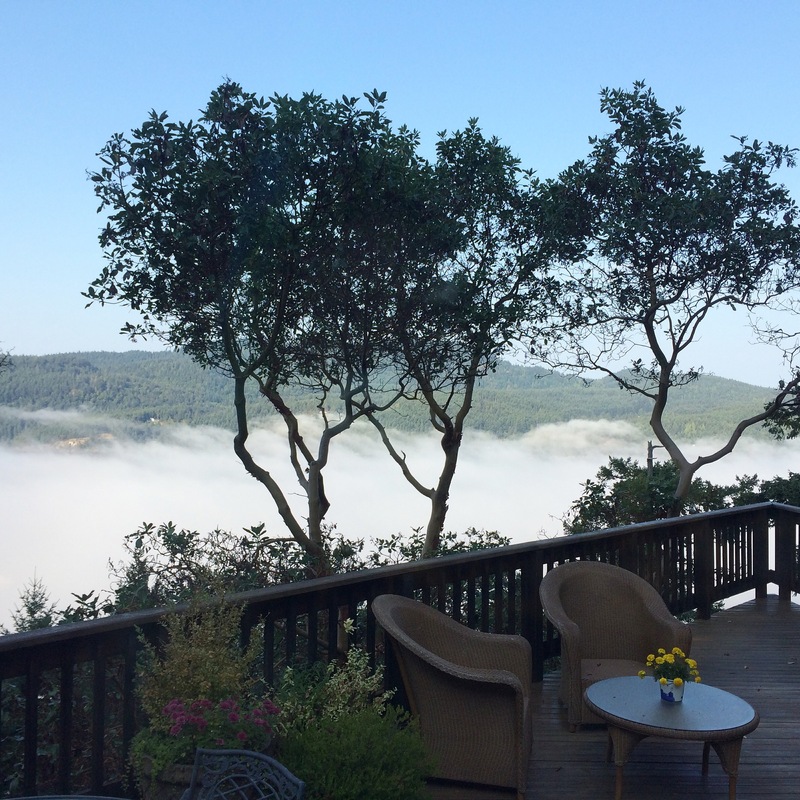 If you’re not as fortunate to have relatives that live in the San Juan Islands or nearby, there are some really fabulous places to stay like the Rosario Resort & Spa on Orcas Island or even renting a home on VRBO. Anacortes is a quaint little town where the ferry takes off from – we ate a delicious lunch at Gere-a-Deli and I spotted a lovely little place called the Majestic Inn & Spa that looked like a fun place to stay with a killer rooftop view. The islands are becoming a more well known tourist destination since Obama declared them a national monument but it still has the charm of an undiscovered location even though we’ve been there a few times. 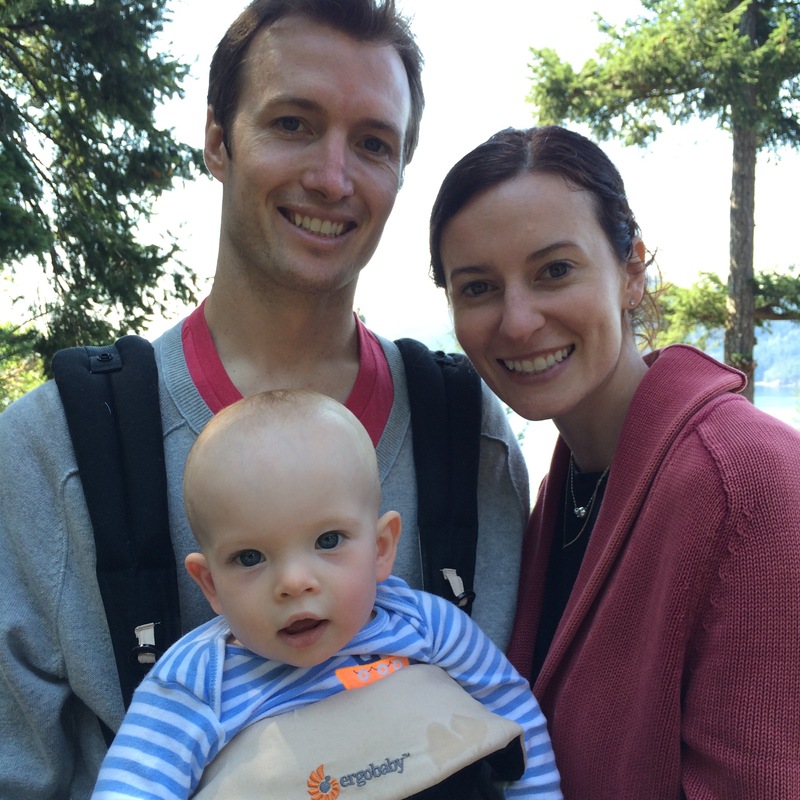 We can’t wait to go back when Declan is running around and ready to explore with us. If you’re thinking of taking a trip there, here are some tips to help you plan. Have you ever been to the San Juan Islands? Where’s your favorite place to get away? P.S. Do you have a happy place? Thanks for reading and sharing, Mary! Happy travels!